(Bloomberg) -- Credit card companies are taking measures to prepare for a turn in the credit cycle. According to a new report from PeerIQ, a company that analyzes the lending sector, credit card companies including American Express Co., Capital One Financial Corp. and Discover Financial Services are increasing their loan loss reserves faster than they are extending credit, signaling that they expect higher losses in the future. “These companies must see early indicators of deterioration in their models,” Ram Ahluwalia, chief executive officer of PeerIQ, said in an interview. “They started doing this a couple of quarters ago,” he added. In the most recent quarter, American Express increased loan loss provisions by 35 percent while loan growth was 16 percent. Discover boosted loan loss provisions by 26 percent on loan growth of 9 percent. As a potential economic slowdown looms, some market participants believe credit conditions are at or near peak levels. Loan growth in the credit card space is slowing as issuers see charge-offs pick up slightly, according to PeerIQ. However, investors that bundle credit card debt shouldn’t be too concerned about the uptick in losses. Credit card companies still see the U.S. consumers as generally healthy, according to the report. The 30-day delinquency rate at major U.S. credit-card issuers - a harbinger of future losses - remains near a historic low, according to data compiled by Bloomberg. 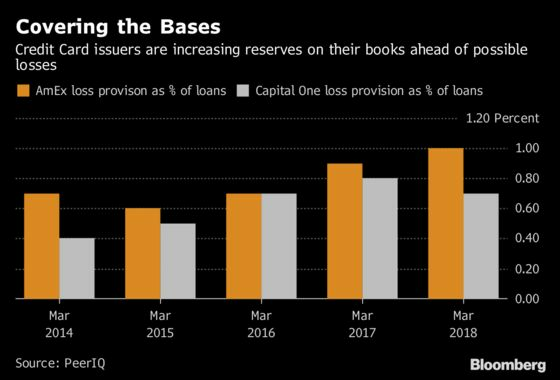 “Credit card bond investors are so well protected that they really don’t have anything to worry about,” Ahluwalia said.